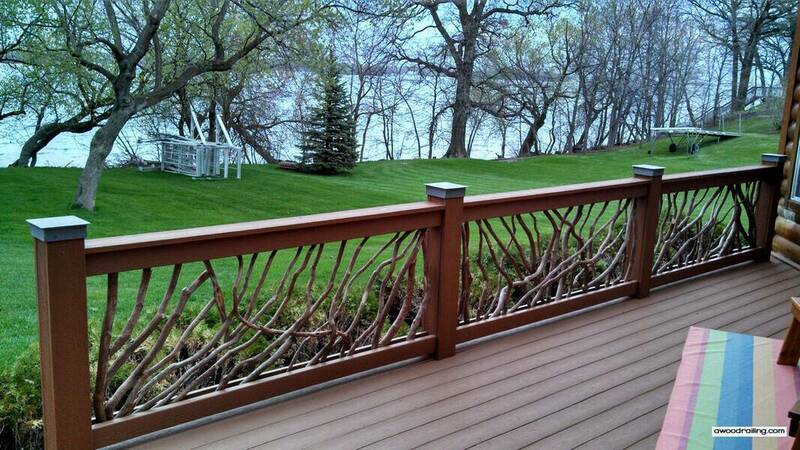 A fabulous deck railing is the best way to make a strong visual statement. 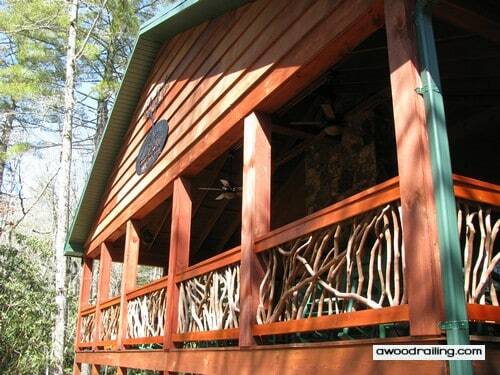 Mountain Laurel Handrails are unique works of art for your deck. This exterior railing system is unlike any other. With beautiful designs you’re sure to find nowhere else, these handrails will give your deck a fresh new look. A beautiful deck demands outdoor railings unlike any other. Are you looking to upgrade your deck in a grand and amazing way? Painting can be expensive and wear down. Canopies can break and get worn out very easily. If you want to change your deck’s look in a dramatic way, consider starting with the handrails. Deck railings are more than something to rest your arms on while chatting with friends during a cookout. They can also be a strong decorative element for your porch and your yard as a whole. So why would you decorate the outdoors with metal or plastic when you could accentuate the natural beauty that surrounds you? Mountain Laurel Handrails are made out of real wood and branches, and they really help pull together a natural, beautiful look for your deck. For an interesting look, the branches can be painted a complimentary or contrasting color. 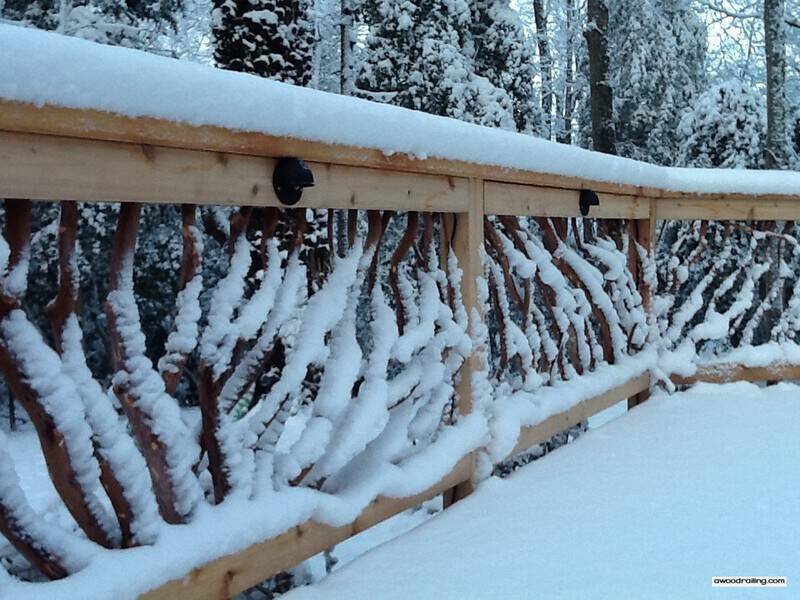 The twisting, turning forms of the branches as they intertwine between the top and bottom bars of the railing imitate the manner in which branches combine to make a forest. Also, the natural wood will compliment your wooden deck furniture nicely, as you can have the same look as other things that you use on your deck. Further, each piece has a slightly different design that will give your deck a unique look, setting it apart from every other deck out there. 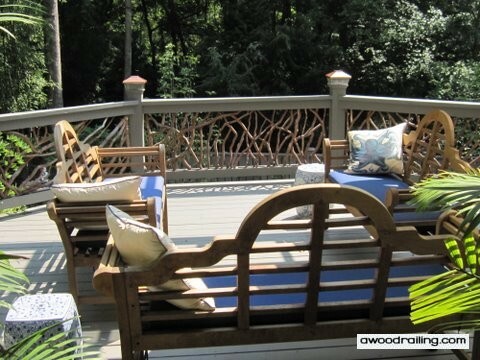 These wood deck railings look wonderful with the nice deck furniture. The organic shapes of the railings plus the welcoming outside furnishings make this look like a charming spot for afternoon tea and crumpets. The forest beyond blends with the deck the handrails blur the line between the deck and forest. The natural shapes, colors, and textures feel right at home in any outdoor environment. As the picture shows, they are subtle, yet add a polished feeling to the deck and its furniture. 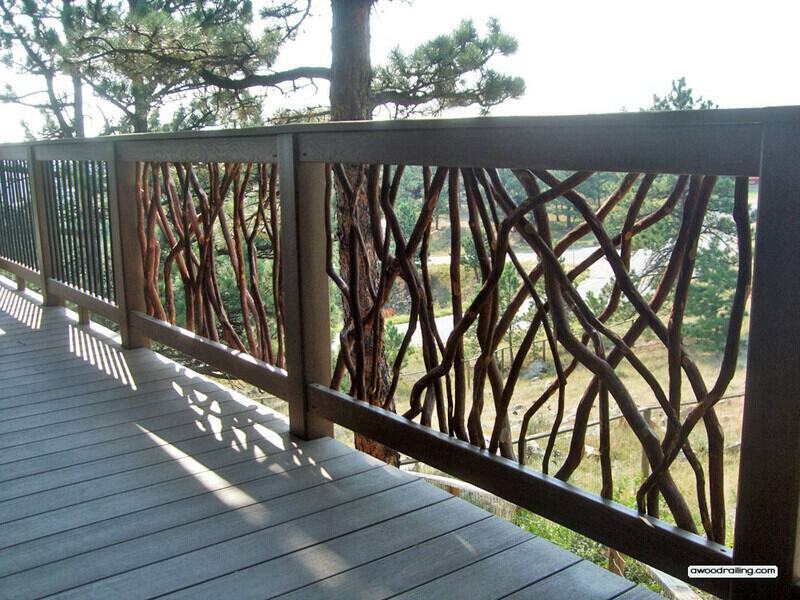 Incorporate natural forms into your deck… Imagine the sinuous shapes of a the sun shining through the trees and these are the shadows you’ll see on your deck after your handrail installation is complete! The idea of natural shapes created by natural light incorporates a feeling of connection with the outdoors. 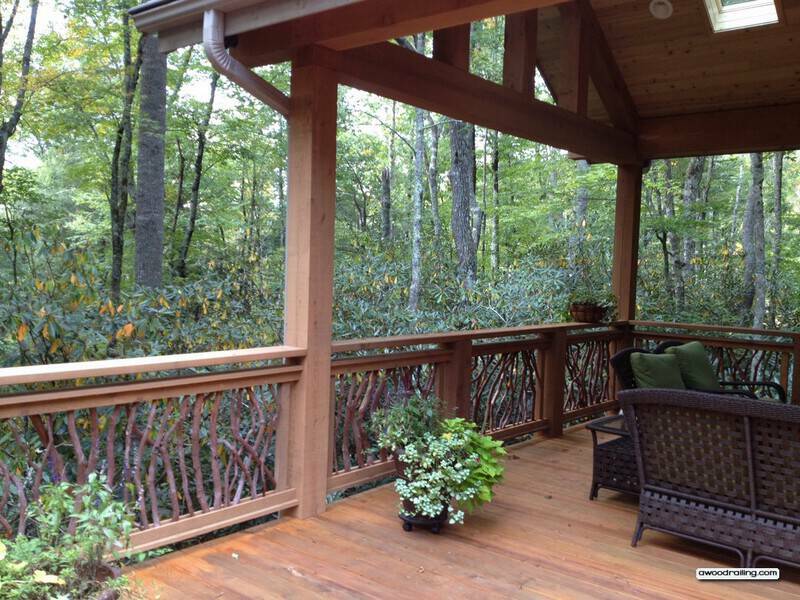 You truly feel like you’re in nature when you’re sitting on your deck! This interesting selection which will definitely cause people to notice their artistic beauty and incredible style. Every single section is individually crafted so no two are ever the identical and each grows its own distinct pattern to make an exterior railing that is undeniably unique. This is a rarity with most brands these days. To be able to say that any given product is 100% unique is very uncommon. On top of it, to have it be so exquisitely crafted is even better. For most homeowners, the way their house presents from the outside is very important. Deck handrail is an extremely visible part of an outside deck. Simply by adding or upgrading, you can completely transform the way your house looks from the outside. 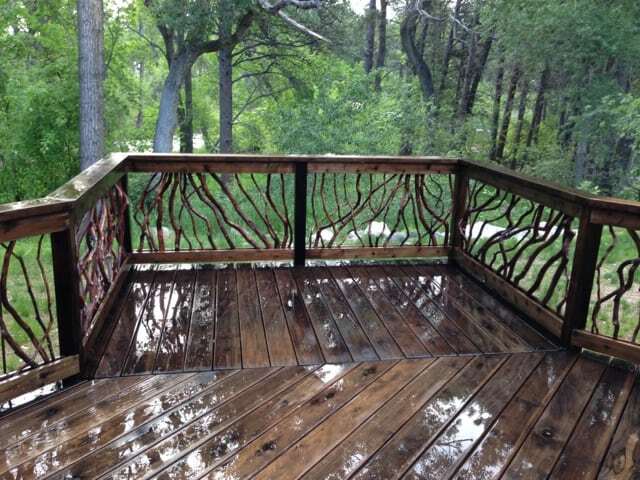 The best deck railings will transform a dull deck into an fascinating element of any dwelling. Take into consideration the diverse selections which are available and you’ll find other choices for deck handrail. You have found the perfect outdoor railing for adorning your home with natural outdoor beauty. This is the system of choice for homes with grand rustic style. They are all custom made to your measurements and can be built to fit any conditions, even joined to round logs with intricate joinery and used as a stair railing outdoors. Since each project is made to order, you can choose the lumber species for the boards, usually this will be the same selection as your posts. The default choice is Western Red Cedar, but other popular choices include: Ipe, Yellow Pine, Oak, White Pine, and even composite lumber. Sticks are often reclaimed from land clearing adding a green touch. 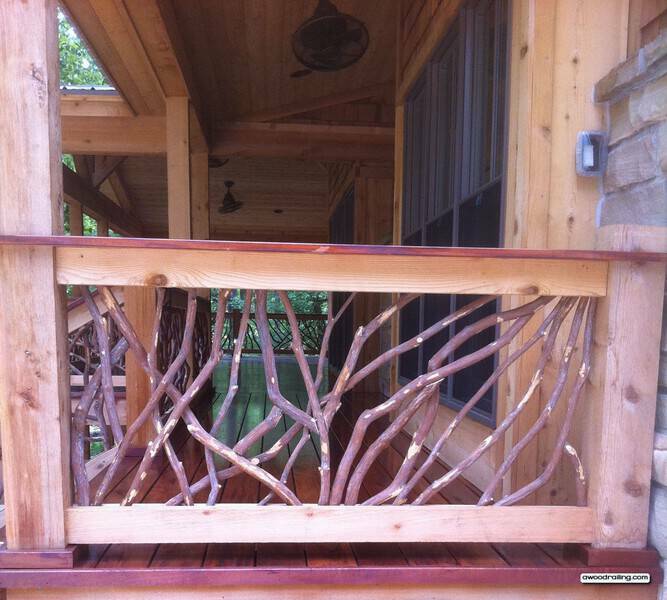 Only the most skilled of carpenters are able to create such wondrous beauty from these sticks and branches which far surpasses aluminum railing products. It requires a tremendous spatial depth perception to figure out how to assemble the sticks into artistic, eye pleasing shapes. 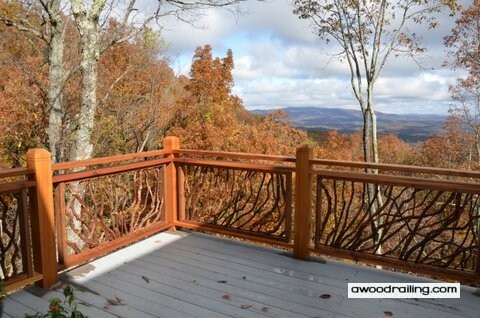 Mountain Laurel Handrails can be used outdoors as a patio railing. 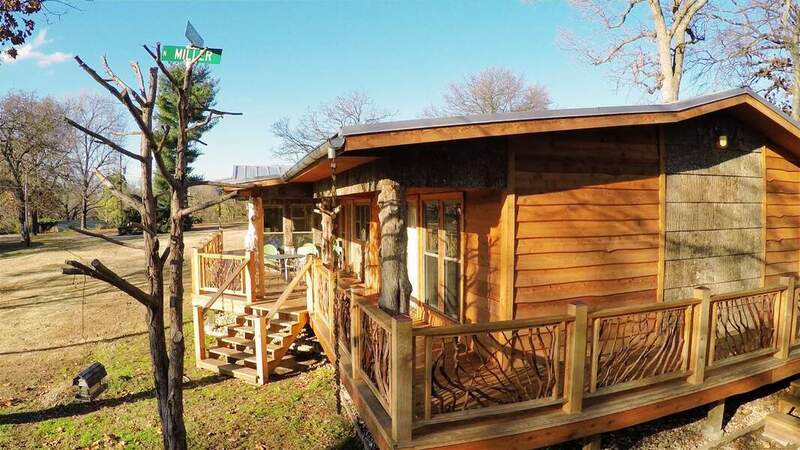 They are a natural fit for a log cabin or timber frame home. And their rustic character adds a certain style to homes that choose to display the jewelry that is these railings. They are perfectly at home in an outdoor setting where they disappear into the surrounding natural beauty. There is really no other railing product that compares! Take time to consider which type of guardrail and balusters would make the most impact on your design, as well as reflect your personality. Deck railings are an important part of making sure your outdoors spaces are safe, but it doesn’t mean they have to be boring. When doing any home construction or remodeling project, it is wise to seek the assistance of a skilled design professional to work with on your project. 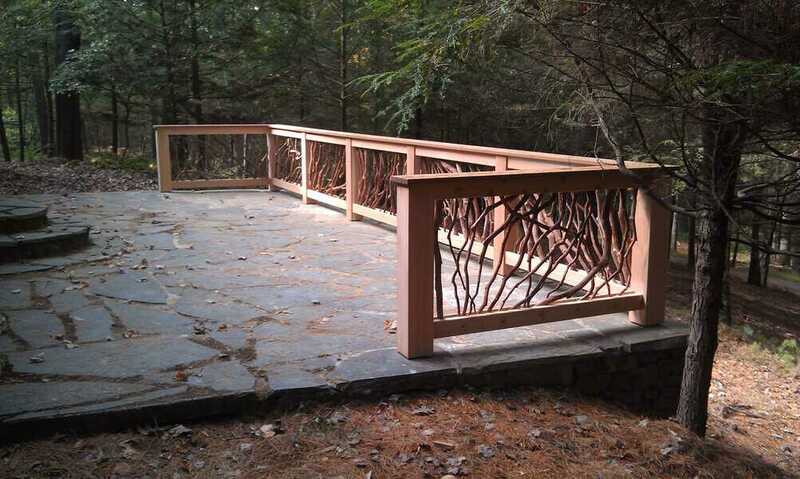 Mountain Laurel Handrails come preconstructed, and you simply need to install the individual sections on your deck. 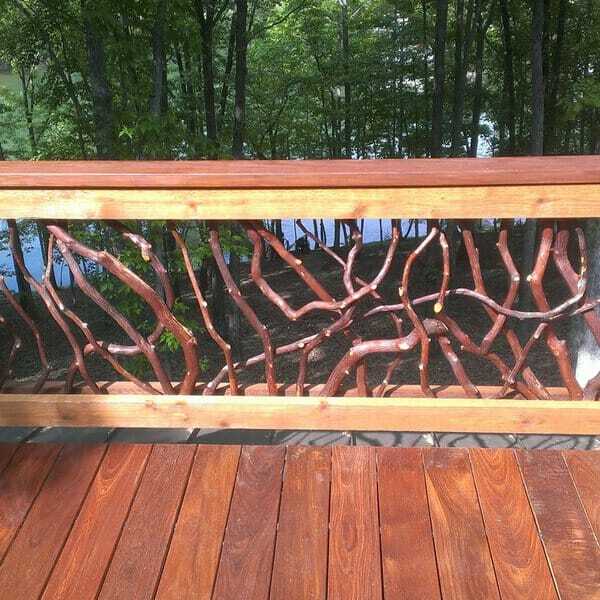 Suddenly, you have a fully detailed railing that will impress your friends and family alike. Break away from boring, staid designs and move to something exciting and sensual! Incorporate the shapes of nature in your deck and enjoy the beauty all year long!